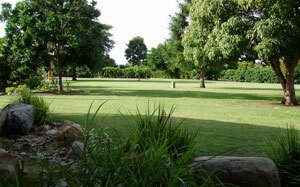 Mackay Regional Botanic Gardens offers extensive lawns, lavish gardens, shade trees, beautiful lagoon views and a variety of wonderful photo settings all within our picturesque 51 hectare site. With its central location, easy access and tranquil views, The Botanic Gardens is an ideal location to celebrate your special day. *Please note all areas are alcohol & glass free. *Strictly NO rice, confetti, balloons or scattering real flower petals. Artificial flower petals can be used, we recommend a carpet to throw them on as anything you bring into the site you are responsible for removing. Due to underground services, no decorations/structures are to penetrate the lawn. All decorations must be free standing and weighed down if required. e.g no pegs are to be used for marquees or Bali flags, weights are to be used if required. 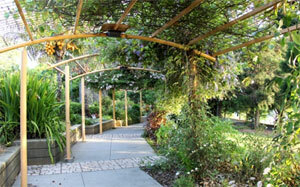 Bookings in the Mackay Regional Botanic Gardens have specific Terms & Conditions. Please read all Terms & Conditions carefully and contact the Gardens Administration Office via botanic@mackay.qld.gov.au or 4952 7300 if you have any questions. 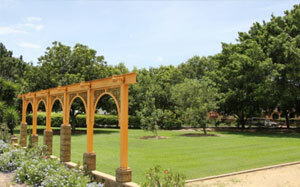 Ceremonies in the Mackay Regional Botanic Gardens incur a booking fee and bond which covers your use of the grounds for a two-hour period, botanic preparation of the site and directional signage to help your guests be guided to the ceremony location. Any other fees incurred such as marquee and chair hire and associated set up costs are the responsibility of the hirer. Tentative bookings (strictly 14 days, no money required) can be made to assist with the planning process. To confirm a booking, payment of the full fee and bond is required along with the completed application form. Please read through the Botanic Gardens Grounds Hire Application carefully. If you have any questions, would like to check availability, or would like to book in for a wedding tour, please contact Gardens Administration on phone 07 4952 7300 or email botanic@mackay.qld.gov.au. Payment can be made in person via cash, EFTPOS or cheque at the following Council offices. By post and addressed to Mackay Regional Council, PO Box 41, Mackay, QLD 4740. Please make cheques payable to Mackay Regional Council. Complete the online application form. Once processed, you will be advised if the application is approved and if so the payment options available. Please contact Botanic Gardens Cafe directly for availability or menu options. Marquee/outdoor style receptions are not permitted within the Botanic Gardens. The infrastructure and facilities provided within the Botanic Gardens are not designed to cater for this style of event.